We are two teenagers (Conrad aka. DalekSupreme08 and Tom aka. 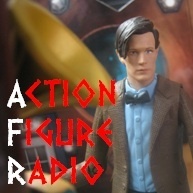 tombaker64) who run a Doctor Who podcast focusing on the action figures made by Character Options. The second episode of our comeback series, featuring an interview with Susannah Leah, chat about Series 7 and at last a Rory figure! The first in our rebooted series, featuring chat about the latest figures, reviews, discussion of the S7 trailer and more!